Noting the Germans claim they have no obligation whatsoever to make right having bled Greece dry during WW II … and noting the Germans are insisting on bleeding Greece dry in the present with inflexible demands of ‘privitization’ and ‘austerity’, it’s not difficult to see Angela Merkel, Wolfgang Schäuble, Thomas de Maizière & friends haven’t shed Germany’s Nazi spots; particularly when considering Ukraine. This, despite the German government’s official position of condemning the German Nazi party, the NPD, a party the Ukrainian Svoboda party has a known relationship with. So, what’s wrong with this picture? Adopting a position ‘actions speak louder than words’, we can look at a short history of Merkel’s ‘peace efforts’ relating to Ukraine. Here is how it plays with Merkel. She gets on board with with every European peace endeavor but then takes advantage of its intended failure. After endorsing a Russian-French transition plan for Ukraine that was immediately foiled with the American backed putsch, Angela Merkel promptly fell into line with the Americans and the result was ultimately responsible for Crimea reunifying with Russia. Did Merkel demonize the Americans for this backstabbing? No. She demonized Putin. Following this, when Poroshenko did not deliver on the autonomy for the east of Ukraine promised at Minsk I, rather instead declaring the autonomy provision invalid, insuring the rebellion would continue, did Merkel pressure Poroshenko? No. She upped the pressure on Putin instead, while toeing the American propaganda line. As well, Merkel has been leader of the European Union sanctions intended to punish Russia with damage to its economy. Now, Merkel had exited a meeting at the White House, prior to traveling to Moscow and then to Minsk II, with a telling message; ‘friends can have differences of opinion’ or that is to say Germany is not going to put up a fuss over the Americans delivering lethal weapons to Ukraine and John Kerry immediately heads out to Kiev as Merkel heads to Moscow. Gerhard Schindler, Germany’s top spymaster, who answers directly to Angela Merkel, presented what has to be called a falsified report, on the downing of MH 17 in secret session with the German parliament, presenting evidence that has never been made public (certainly because it would not stand up to expert scrutiny.) Here is the better MH 17 assessment. Previous to this, Schindler presented what was almost certainly a false report on the Assad regime’s use of sarin gas in Damascus, claiming the rebels did not possess the technical ability to deliver the chemical weapon but that had already been disputed by UN investigator Carla Del Ponte in an earlier case. The BND led by Schindler has a long litany of criminals and crimes for legacy, not least complicity in, and covering up, Operation Gladio. 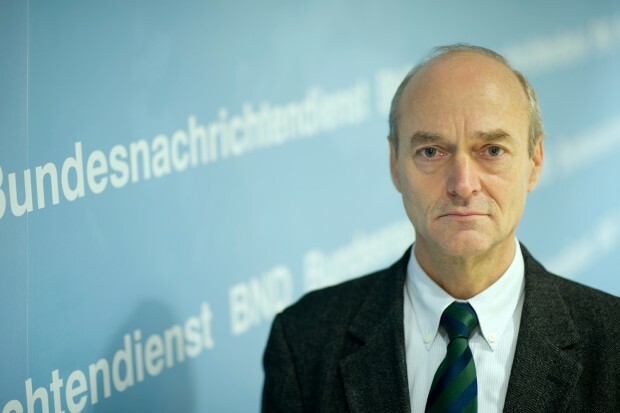 The BND was created by the CIA, staffed with ex-Gestapo and other former Nazis, put under the charge of Hitler’s expert Soviet spymaster, war criminal Reinhard Gehlen, and then handed over to Konrad Adenauer as West Germany’s foreign intelligence service. This is a nasty, Nazi legacy infected, organization. And so is the Adenauer Foundation and it’s parent Christian Democratic Union. These are Merkel’s clandestine bayonets operating in Ukraine. Here’s my prediction for Minsk II .. more of the same, Poroshenko’s Nazis will have taken John Kerry’s off the record advice to heart, the new ceasefire and peace agreement will be sabotaged with full German complicity, even as Merkel makes a show of geopolitical ‘restraint’ for domestic political consumption, again buying time to rearm and train Kiev’s forces. Meanwhile there will be ongoing provocations by Kiev to undermine the process in its entirety. Germany will fall into line with the USA, pointing the finger at the Russians as the responsible party and sooner or later, the entire business will again be a hot and more intensified conflict. This has been the working model, in consecutive iterations, why would anyone expect to see anything change? It’s not going to change, but also the Ukrainian ability to keep fighting is reducing by the day. Even according to the Porostani figures the last mobilisation had a compliance rate of 6%. So the longer this goes on the less able Ukraine becomes to fight and the more dependent on mercs and Western troops. That can’t stay secret and when the body bags start coming home the choice in the West will be between open war with Russia or backing down. The sanctions have already reached the point of diminishing returns. With 8,000 Ukrainian soldiers trapped in Debaltsevo, one can only wonder how desperate the western intelligence agencies might be to extract ‘assets’ including mercenaries. What is the formula to solve this newest humiliation of Kiev? Surrender Debaltsevo? I doubt it. For that likely fact, we may not see this newest ‘ceasefire’ take hold at all.